Trifecta offers wholesale linen products specially designed to meet the unique bedding needs of medical and home-care facilities. Combining comfort and durability, our top-quality linens are tightly woven to withstand the rigors of daily use. Trifecta wholesale linens adds a touch of class to any hotel room. From bath towels to bed sheets, our top-quality linens will keep your guests feeling relaxed and comfortable. 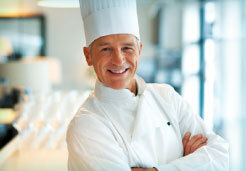 Trifecta offers a broad selection of quality-woven linens for the restaurant industry. From tablecloths to aprons, our colorful linens add style and sophistication to any restaurant or dining room. Trifecta Linens is a privately owned and operated company established in 2012. We offer the best wholesale linens for hospitals, hotels and restaurants—combining cost, quality, and durability for our valued customers. A leading supplier of commercial and institutional linens, Trifecta brings the ideal combination of quality, cost and customer service to the medical, hotel and restaurant industries. Luxurious yet durable, our finely woven linens are made to ISO standards, and are specially designed to withstand the rigors of heavy daily use. We offer a large selection of styles and colors to meet the needs of your establishment. We accept special or custom orders of any color or type of linen. And our fast, friendly customer service includes wholesale pricing and international shipping. For quality linens at a price you can afford, choose the wholesale linen specialists – Trifecta. Our ISO certified factory in China produces the highest quality linens for international distribution. All products are created from breathable, environmentally friendly materials. Products are tested thoroughly for durability and water resistance. The result is long lasting, easy-to-wash, high-quality linens.